Week sixty one and my bakes this week helped take my mind off what I am facing tomorrow…but more of that later. This week’s bakes were also disappointing in some ways too…. I delved into Mary Berry‘s Baking Bible and wanted to make a start on my Christmas cakes so I chose her fast mincemeat Christmas cake recipe and dug out my trusty Lakeland cake tin that can be divided into smaller cake sizes so I had four square cake tins. Mary’s recipe is the strangest Christmas cake recipe I have ever made, and I make Christmas cakes for friends and family most years. usually I am up to my armpits in various dried fruits, candied peel, brandy etc. but nope, not this year. Mary’s recipe uses mincemeat in a jar along with some sugar, currants, flour, butter and some eggs. That was pretty much the recipe. I made four batches and poured them into my tins which were greased and lined. I popped them into the pre warmed oven for the hour and three quarters that Mary states. After the timer pinged, I got my trusty skewer and checked the cakes. Imagine my disappointment when I saw that all four cakes had sunk. I hadn’t opened the oven at all during the bake and had pre warmed the oven so I don’t know why they did. I was very disappointed but took heart that the bottoms of them were flat so that will effectively become the top but I will know that they weren’t right. I will now wrap them in foil, feed them a little alcohol- Mary doesn’t add any to this cake and I think a little gives it some flavour. I will also then decorate them and fancy trying some sugar craft modelling….. The second recipe was Mary’s carrot cake. I had a major problem with Mary’s recipe because it has banana (in a carrot cake?!) and I can’t use banana in anything at home because of hubby’s allergy. 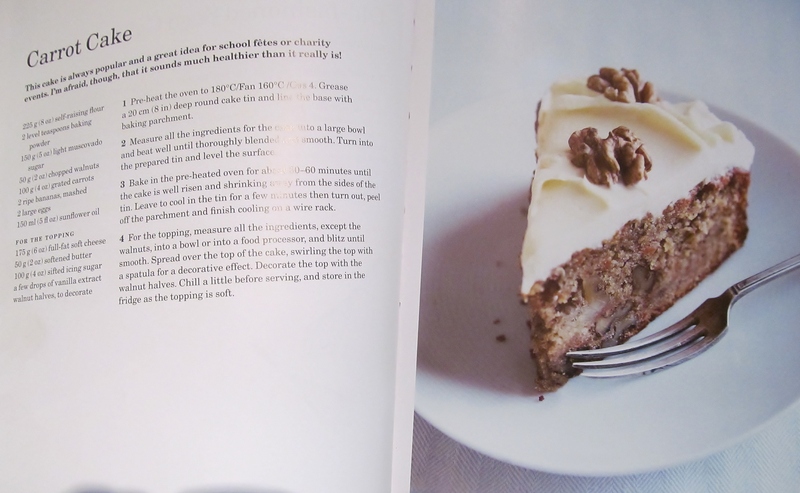 So I looked on Mary Berry’s website and found that she does a lovely carrot cake recipe without banana here . I also decided to make it as a tray bake rather than the usual cake. I mixed all the ingredients together and popped the tray bake into the oven. After the allotted time, the cake was done and a lovely golden brown. I left it to cool in it’s Lakeland tray bake tin and set about making the creamy topping. 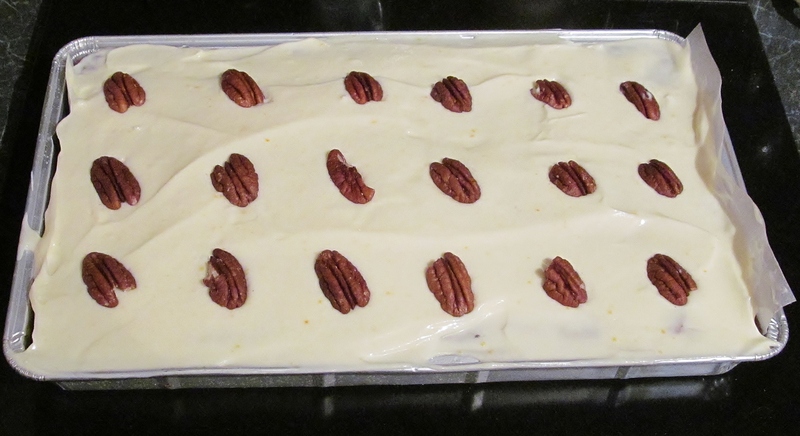 I spread the topping over the tray bake and put pecan nuts on it rather than walnuts and popped it into the fridge. I can’t wait to try a slice of this…. For those of you who drop by this blog occasionally you will know that at New Year last year, I had to go into hospital for some surgery. Well tomorrow I have to go in again for another small procedure- small in time spent in theatre but a reasonable time recovering. Hence the blog actually being on time today and I am not yet sure if I will feel up to baking at all next week yet. I am having this procedure done. Finally, I got to see the Day of the Doctor last night. In case you hadn’t guessed, I am quite the Dr Who fan and thoroughly enjoyed the 50th anniversary program last night. Well worth the wait and way beyond any hype. I pressed the red button after the program and also enjoyed the Five doctors (almost) which had Peter Davidson, Colin Baker and Sylvester McCoy in a spoof drama trying their hardest to get cast into the program. It was hilarious! 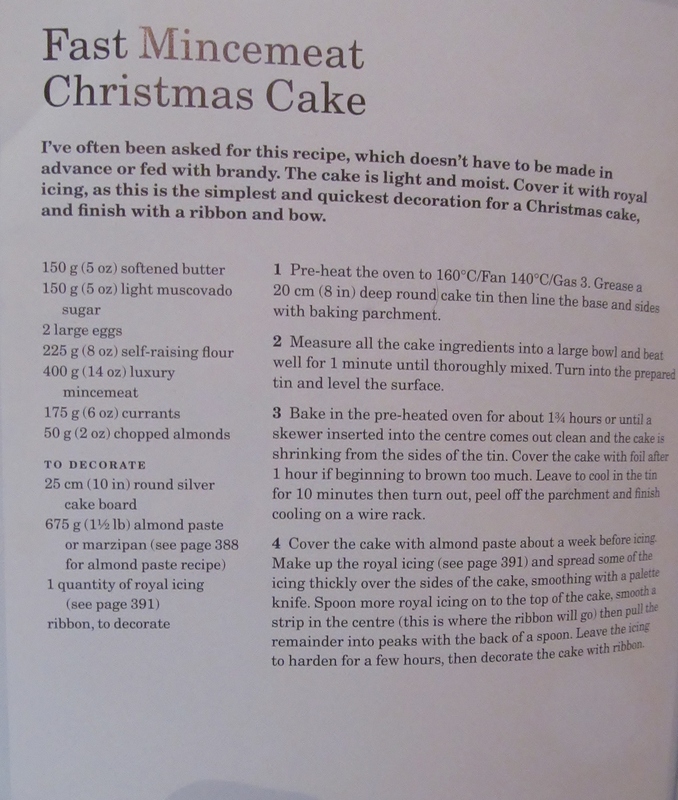 This entry was posted in Kim's cake challenge and tagged Baking Bible, Cake, Carrot cake, Christmas Cake, Doctor Who, Kim's Cake Challenge, Mary, Mary Berry, Mary Berry's Carrot Cake, Mary Berry's Fast Mincemeat Christmas Cake by kimsideas. Bookmark the permalink. A: Oven door opened too soon or under baking. Q why do cakes sink when oven door not opened until time given in Mary’s recipe? And they were well sunk then?